I have always been interested in Open Educational Resources from around the world, and in my presentations, I do my best to highlight not just MIT and Stanford, but also the amazing contributions from Indira Gandhi National Open University in India, the Virtual University of Pakistan, the open textbooks from Indonesia, the Chinese Top Level Courses, and more. I find it wonderful that we can now virtually travel around the world, "peeking" into classrooms, and learning from each other. This idea of transparency is one of the four purposes of OERs, and I have tried to illustrate it through my little YouTube mashup of lecture videos in many languages. 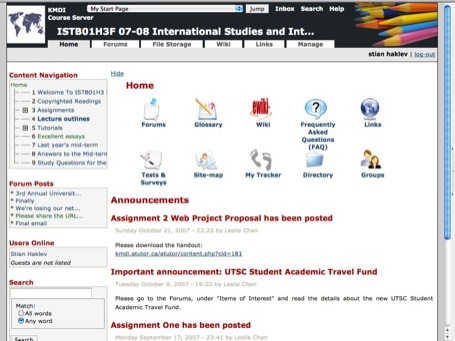 During Open Access Week 2010, I gave a presentation at both the Scarborough and Missisauga campuses of University of Toronto entitled: Global Open Educational Resources and the University of Toronto as a Multicultural Institution, where I discussed how students with many different mother tongues could relate to these resources, both as users and producers. I later had a chance to visit the United World College of the Adriatic, my old high school. 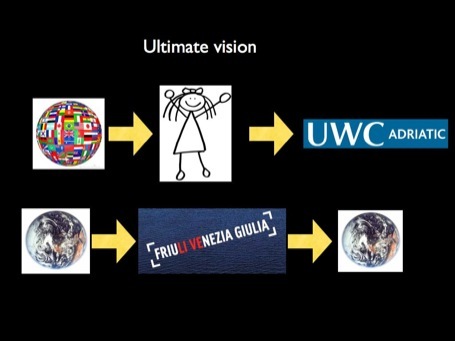 UWCAD is an international school in Italy, with young people from more than 70 countries who come together to pursue excellence in studies, and promote international understanding. There, I was invited to give a version of this talk, called Multilingual Open Educational Resources for a Multilingual and Multicultural UWC to a full assembly of 180 students, teachers (including many of my old teachers), and staff. For various reasons, none of these talks were recorded, which is unfortunate. I hope I'll get a chance in the future to give a similar talk, which I can record and share online, but in the meantime, I thought I'd try to blog around some of my slides, to share some of my ideas. 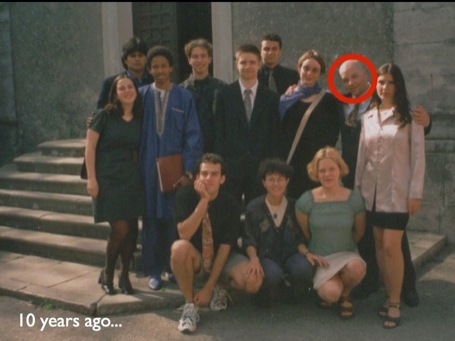 So this was my "proof" that I did indeed attend his school, it's one of the pictures from the yearbook, taken ten years ago. You see me in the back row, and the woman in the centre of the front row was my Italian teacher, Cristina Leban, who was one of the most inspiring teachers I have ever had. The UWC system is quite interesting, it was started by a Kurt Hahn, a German who wanted to make sure that something like the World War II never happen again. His idea was to bring together young people from around the world, perhaps some of which would become future leaders, and engage them in a program of scholastic effort, sports, creative activities, and service to the community. A program so intense that the students, who only had each other - far from their own country, language and family - would form life-long bonds, and would not go to war against each other. I could write a lot about my time in Duino, Italy - it was an absolutely amazing time for me, and I think it was an important contributor to me becoming who I am, although I'll never know how much it changed me. Having this chance to go back there, and engage with the students who are now going through what I did ten years ago, was a wonderful experience. I must also thank the headmaster, whom I met this summer, during my ten year anniversary visit to Duino. When I told him about my ideas, he said: "Why don't you come back during the school year, and tell this to the students - we'd much rather have these kinds of initiatives come from them, rather than be initiated from the top." I was very impressed by this attitude. I began by providing some examples of the incredible richness of OERs and other open resources that exist in the world. The fun change from when I usually give these presentations, was that there was probably at least one person in the audience who understood the language of every single example I gave. 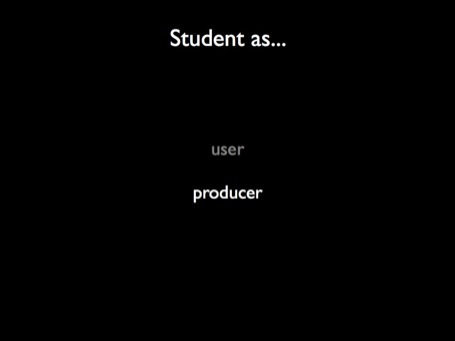 I won't repeat this here, but my 2009 presentation about OER around the world is a good intro. I also talked about the concept of openness, Creative Commons licensing, the importance of not only using an open license, but also using open (editable) file formats to enable reuse to happen. You can see this portion of the talk in the talk I gave in New Delhi about openness and P2PU. After having introduced the fact that there is such a wealth of open resources in all languages, and created some awareness about the importance (and potential) of openness, I began to tie this together with the multicultural character of the UWCAD. I told them about a class that I tutored at the University of Toronto. Just like the UWCAD students, my Toronto students were incredibly diverse, the only difference being that many of them had grown up in Toronto, whereas the Duino students all arrived directly from all their respective countries. During the second lab session, I wanted to give the students a feel for how the web had developed during the last decade. We discussed a number of different aspects that had changed, and I then asked the students in groups of two to use the Internet Archive WayBackMachine to choose a website to examine. The WayBackMachine periodically archives the entire web, and allows you to view snapshots of websites as they looked last year, or 10 years ago. I asked them to choose a large website that was likely to have been around 8-10 years ago, and compare todays version with the archived version. Since many students with the same language sat together, I said that they were welcome to choose a website in their own language. One unexpected outcome of this was that several groups of Chinese and Korean students reported that on the archived pages there were just boxes or question marks instead of text. I told them that this was because at the time the pages had been written, there was no universal Unicode standard, and that they would have to manually select the character set for the page from the browser’s menu. This led to an interesting discussion about how support for multilingual computing had developed, and the possible impact this could have had on the development of technology in different countries. As our class proceeded, I often pulled in international examples from my own experience, and encouraged students to do the same. We had an interesting discussion about different ways of mapping the world, which began with my displaying a Chinese world map -- where China is in the middle of the world, and the American continent is on the right side -- and continued with students finding other national examples of maps, and discussing how it might change people’s perception of the world to be used to seeing maps that present the world from a certain perspective. 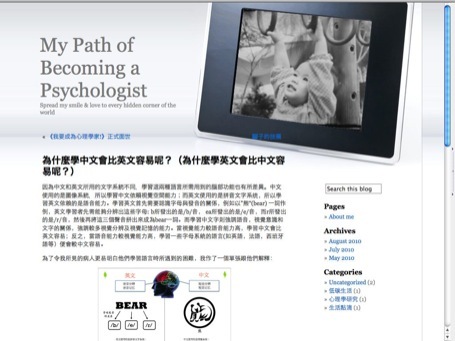 On another occasion, I showed examples of Chinese webpage design, where the frontpage is often crammed with links. We discussed how web aesthetics might be different in China and in the West, and whether this was likely to converge (given the number of large American websites like Facebook and Youtube which have been copied whole-sale into Chinese versions), or diverge further. Finally, I showed them examples of government webpages from Indonesia that used Flash, and how that might impact usability in a country where most computers are not very powerful. These discussions all continued in our online discussion fora, which gave some of the students that were not active in class, a chance to contribute as well. ...the students chose a country and a topic (for example e-Health in Sudan or e-Democracy in India), and worked in pairs to develop a project proposal to the Canadian International Development Agency. 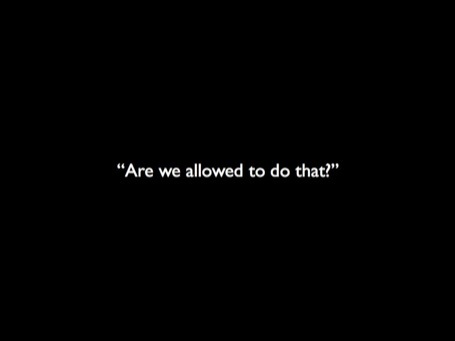 They first had to hand in a draft, and then develop a finished proposal in the form of a website made with DreamWeaver. We emphasized the need for in-depth research, both to establish the needs analysis, and to prove that their proposed solution had a high likelihood of success. Given that the students in the class came from different fields of study, and many did not have experience with writing major papers, I spent significant time on discussing how to do research, what sources qualify as “reliable”, and the difference between peer-review and non-peer review. Yes, they were shocked to hear that they were "allowed" to use sources in Chinese. I specified that I wanted academic sources, not blogs or newspapers (I had previously spent an hour going through reliability of sources, peer-review and grey literature, etc), and their second question was: "How can we find that?". Although they had been at University of Toronto for four years, nobody had told them that the university subscribes to a database with 9.000 Chinese journals in full-text. In the end, they turned in one of the best projects in the class, citing both English and Chinese sources, and I began thinking more in-depth about the importance of encouraging students to include material in their mother tongue when doing research. After this experience, I became very interested in the idea of encouraging undergraduate students to include resources in their own languages during their research projects, and I went looking for interesting case studies, research on teachers' attitudes to students doing this, resource guides on how bilingual students can be more effectively supported in the classroom... And I found almost nothing. There is a wealth of information about multiliteracy in kindergarten and primary school (see this wonderful project in Toronto), but for universities, there was almost nothing. Even when I wrote to a number of the central people in the field, I was told that it was a great area to research, but that they unfortunately could not help me. So how can our universities and colleges treat students' own languages as a resource? Can open resources help with this? Well, in the case of University of Toronto, I argued that students should be encouraged to include resources in their mother tongues when doing research for papers (and indeed other languages that they might happen to speak), and the existence of Open Access journals can play an important role here - because not every university can afford to subscribe to databases of foreign journals. 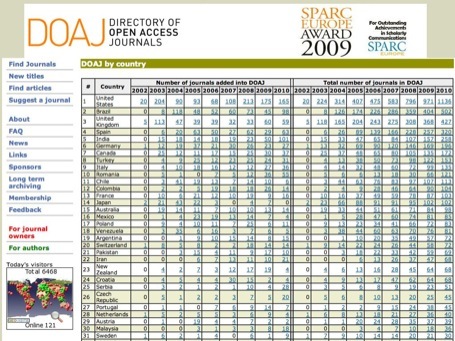 Luckily there is a wide range of Open Access journals available in most languages, below you see an overview of languages at the Directory of Open Access Journals. The first country listed is the US, but after that comes Brazil, and among the top countries, there is both Spain, India, Germany, Turkey and Italy - many of these journals are in languages other than English. Open repositories at universities, as listed for example at Registry of Open Access Repositories, can also be a great way of finding academic publications in other languages. But my primary concern at the United World College was not primarily research and open journals. Rather, it was the realization that the International Baccalaureate, which is taught at the school, is very Western-centric. When I arrived at the school, I thought it was very different from anything that I had ever experienced, and I think most students, including the Italian ones, felt the same. So I always thought of the school as kind of an "airport" - where everyone belongs or are strangers to the same degree. But when I later traveled to China, I began to realize that for some people, coming to the school had been a much larger transition than for others. 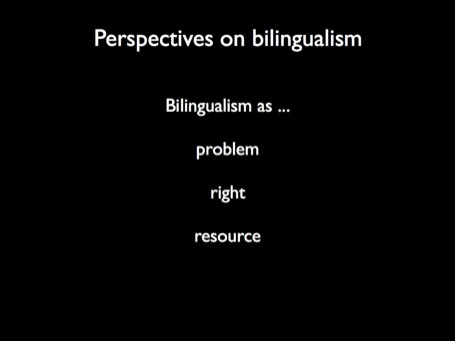 I remember being very disappointed when I found out that the history curriculum only covered European history, and although the extra-curricular life at the school was incredibly rich with "multicultural interactions", I believe that life in the classroom was characterized by seeing "language as a problem" - bilingualism as a challenge to be overcome (by improving your English), not as a rich resource. I believe the curriculum in the school is in many ways quite disconnected from the various educational and cultural backgrounds that people come from, and while this is certainly not the main cause for a large percentage of the students choosing to continue their studies in anglophone countries, most would probably find continuing in a Western anglophone educational system, easier than returning to their home universities. I made the example of a student who after two years at the school might now know how to say "marginal return of investment" in Lithuanian (of course, after the lecture, a student came up to me and told me exactly how to say marginal rate of return in Lithuanian!)... Imagine if a Chinese student was attending a class on World War II - certainly taught by excellent teachers, but also certainly giving the Western perspective of a war that began by Germany invading Poland in 1939, and mainly taking place in Europe, except for Pearl Harbour, Hiroshima and Nagasaki. I know this, because this is exactly what I learnt, when I took History Higher in Duino, ten years ago. 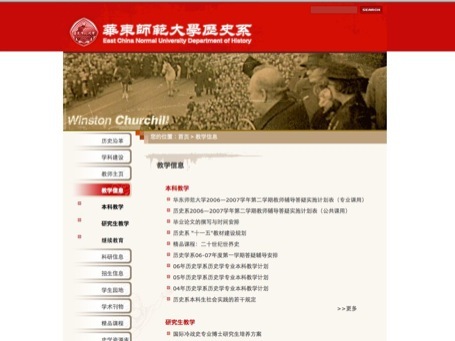 Imagine that this Chinese student could go back to her dorm, and look up a course on the World War II from East China Normal University, and listen to a lecture in Chinese, from the Chinese perspective (picture above is an existing open course on WWII in Chinese). She learns all the terminology in Chinese, as well as in English, and personally gains an alternative view of the history of the war, for example that it began in 1937 with Japan's invasion of China. This would also help the student connect what she was learning at the college better with what she had already learned in school, and through her growing up in China. But ideally, she could then bring this perspective into the classroom on the next day, thus making the class a richer experience for everyone, and turning "language as a problem" into "language as a resource". Right now, if you only compared the inside of the classroom of a United World College, with the inside of a classroom of a prestigious IB school in Toronto, the only difference might be that many of the students in Italy have problems with English - a deficiency model. Wouldn't it be great if the inside of the classroom was enriched because of all of these international perspectives, and language was seen as a strength and a source of richness? However, I didn't come to Italy just to talk about how students could use the OER that exists out there. I wanted to talk about how they could become producers. In English, there is a huge variety of resources on almost any topic. Wikipedia is a good example, the English version seems to many to be nearly "complete". Certainly, there are many niche topics that are still not well enough covered (like Indonesian poets), and there are probably articles that could be considerably improved, but much of the "low-hanging fruit" is gone. If a student goes to a topic, they are likely to find a ten-page long article, with many citations. Only someone with a lot of confidence and expertise would be likely to feel comfortable adding to this article. This might be part of the reason why there has been a decrease in participation on the English Wikipedia. However, this is not the case in many other languages. For example, the Wikipedia in Hindi, a language spoken by 600 million people, still has only three sentences about Norway (roughly: Norway is a country in Europe, it's capital is Oslo, it's main and official language is Norwegian). And similarly, above, you see the article about Trieste (the nearest big city to Duino) in Hindi. This is an obviously example of an area where a Hindi-speaking student could sit down and right away add several paragraphs of text. 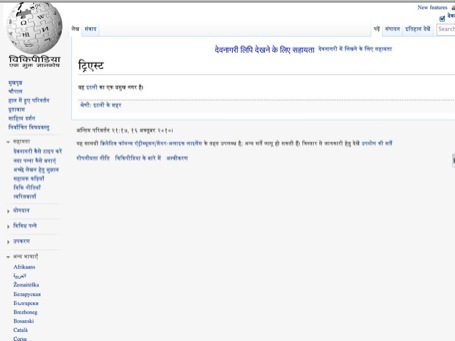 This does not only pertain to Hindi, but to many languages, some which are big in the real world, but small on the Internet, like Hindi, and others that are small in both spheres, like Siswati. 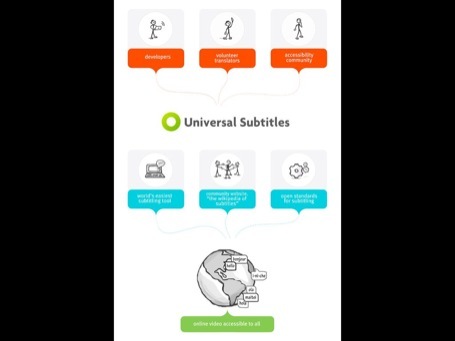 There are many opportunities to make a contribution - editing Wikipedia; using Universal Subtitles, a tool developed by Mozilla to enable you to subtitle a movie on any website in the world, to subtitle educational videos; translating existing open educational resources, etc. My room mate, who happens to be an ex-UWCer from Hong Kong, is currently studying psychology in Toronto. She decided to start a blog about her studies for two reasons. Firstly, she felt that she lacked the ability to communicate in Chinese about her subject of study, which was a real problem, since she hopes to practice in Hong Kong in the future. She also wanted to share with students in mainland China some of the knowledge she had gained through the opportunity of studying at the University of Toronto. Similarly, I suggested to the students that they could begin blogging about their subjects, in their own languages. Or even about the fantastic cultural excursions that the school organizes, to cathedrals in Firenze and Bologna - imagine a blog in Mongolian, or Korean, with pictures of great arches, and explanations of the historical significance. 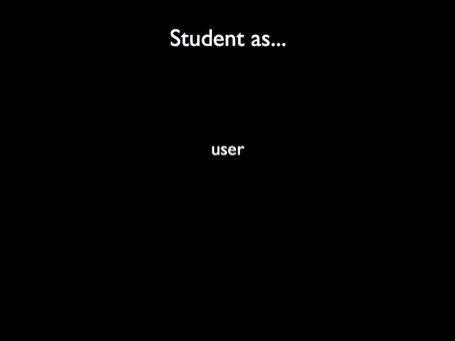 I've often given talks about OER, and in addition to informing people of what is out there, I also hope to encourage them to change their daily practice - to begin to use new resources, perhaps, or even to create resources, share their existing work, join P2PU and propose a course, etc. It's very difficult to know what will be the outcome, and often I think of it more as sowing a seed, which can be nurtured with more exposure, discussions, and thinking - it might not lead to immediate action, but it still has an impact. However, in this case, I was really hoping to create some real change. And since I had been a student at this school myself, and knew more about how it operated, and how engaged and committed the students are, I made some concrete suggestions for things they could do. In addition to the regular subjects, the IB curriculum includes something called CAS - Creativity, Action and Service. Every student has to participate in one creative activity, one sport or athletic activity, and one social service each week. These are supervised by teachers, and a huge variety of them are offered. When I went to the school, I did basketball and kayaking, I ran the weekly Focus seminars on foreign policy, and contributed to the school newspaper, and I helped distribute food to homeless people, and took a Red Cross course and helped out at a transport ambulance. My idea here was to create a new creative activity centered around the production of open resources in different languages. This is partly because I know that the students are incredibly busy at the school, and if they could be able to block off one or two hours each week for this activity, they would be much more likely to do it. Another requirement of the IB is to write an Extended Essay. This is almost like an undergraduate honor's thesis, where a student chooses one topic, works with a supervisor over six months, does research and writes it up. Some of these papers turn out to be very interesting, both because the students at this school are amazing, and because they often do research in their home countries over the holidays, and write about topics that you might not find well covered elsewhere in the literature (in English). I did my essay about a Somali immigrant association in Trieste, and tried to answer whether a monoethnic immigrant association promoted or hindered the integration of its members. My analysis was of course not comparable to that of someone who has studied sociology for years, but I might have been the only one ever to have written about that specific organization, so I would argue that my study still has some value to the world. Certainly enough to warrant it not sitting on my shelf. 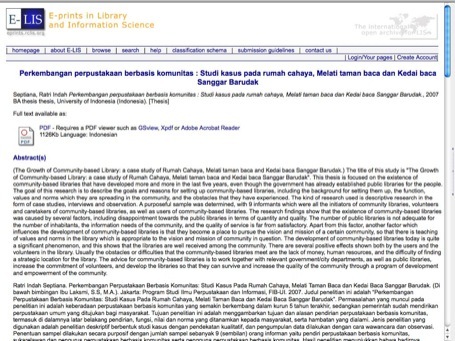 My best example of how important it is to make student papers available comes from when I was researching the Indonesian community library movement for my BA thesis. This was a very large phenomenon in Indonesia, but I could not find a single academic paper written about it. Finally, someone I knew at the Ministry of Education told me that an Indonesian undergraduate had emailed her and asked for info about the program because she was writing her BA Thesis about it. I got the student's email, and wrote to her. She wrote back, and enclosed a soft copy of her finished thesis. It was great - 120 pages, several case studies, full transcripts of interviews, bibliography of works I could not have found without access to Indonesian libraries. At this point, it was the only academic paper about the Indonesian community libraries existing in the world (that I knew about). So I thought - how is it that the only way I can get access to this, is through a friend of a friend? So I emailed her back, and said: Can I please get permission to post this online? She was skeptical, saying that it was only an undergraduate thesis, she had only written it to be able to graduate, it wasn't all that good, etc. But finally she gave me permission, and I posted it on E-LIS, a repository for library research. So far, the thesis has been downloaded more than two thousand times! And most of those downloads come from Indonesia. When I told her that, she got excited, and said that she would ask all of her classmates to upload their theses as well! 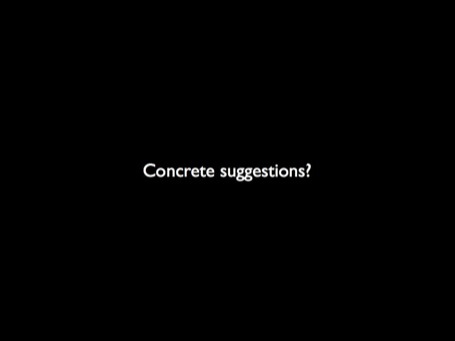 So my concrete suggestion was for the school to set up a repository where students who agreed, could post their Extended Essays. 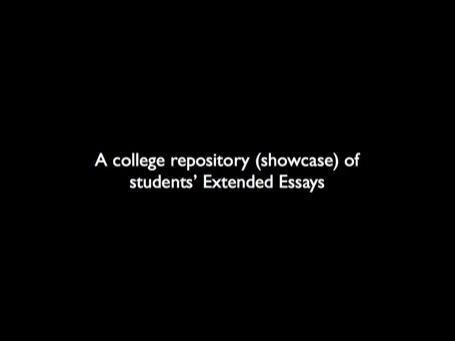 This would be a wonderful way of showcasing the amazing work that happens at the school, and I would certainly be very interested in subscribing to an RSS feed that displayed the abstracts of new student research papers! Interestingly, teachers in attendance broke in, and told me that this was impossible, because the IB holds the copyright to the students' work. I thought this was very unreasonable, and was preparing to publicize this overreach, but a few days later I heard that they had checked with the IB, and in fact, it only required a non-exclusive license to the work, and that the students were free to do what they wanted with the theses. So that's a great clarification to come out of the talk. At the time I gave the talk, I was also scheduled to attend my first TED Talks. 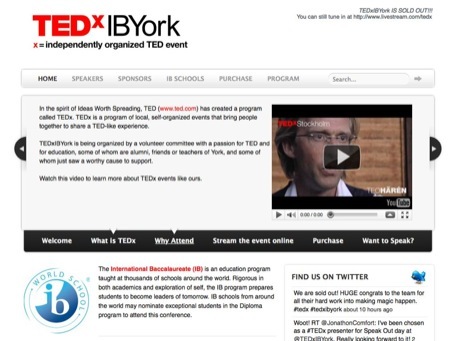 TEDxIBYORK was an event organized by an IB school in Toronto. They had invited student speakers from IB schools in the US and Canada who spent one day competing against each other for the best presentation, and the second day, they had a variety of very impressive adult speakers, as well as some of these student speakers. I suggested to the students in Duino that they could try to organize a TEDxDuino, or TEDxTrieste. Trieste has a variety of great institutions and people, and it would be a great experience for the students to reach out to these various people, and organize such a conference. Thus my ultimate vision would be that students come from around the world, to the school. But they bring the world, or their home culture and language, with them, and use it not just to enrich their own learning, but to enrich the entire school. Secondly, the school helps bring the world to the region Friuli-Venezia-Giulia where it is located, but it also helps bring the region to the world. The response I received from the talk was wonderful. There was a long line of students wanting to talk to me after the talk (including the one who wanted to tell me how to say marginal rate of return in Lithuanian). Unfortunately I had to leave later that afternoon - I had already been gone for two weeks (this was right after the Drumbeat festival in Barcelona). However, I had a chance to meet with a number of students before I left, and I promised to stay in touch with them. After I left, they have taken the initiative to start an open resources group, and have had several meetings. I have been in contact with them over e-mail and Skype, helping them figure out the best approach, and what tools to use. I have also encouraged them to begin documenting the process of setting this up - since it could be very useful to other groups who are interested in doing the same thing. I am very excited to see what wonderful things will come out of this, and will certainly be reporting on it in the future!